Happy Thanksgiving everyone! Not only is it Thanksgiving but it is also my birthday :) My birthday normally falls on Thanksgiving every 3 years or so and this year is the year! It's always been fun celebrating Thanksgiving and my birthday with all of our family at the same time. Speaking of Thanksgiving, I am SO glad that the Holidays are finally here! Right after Thanksgiving means Christmas, Christmas, Christmas and I CANNOT WAIT! 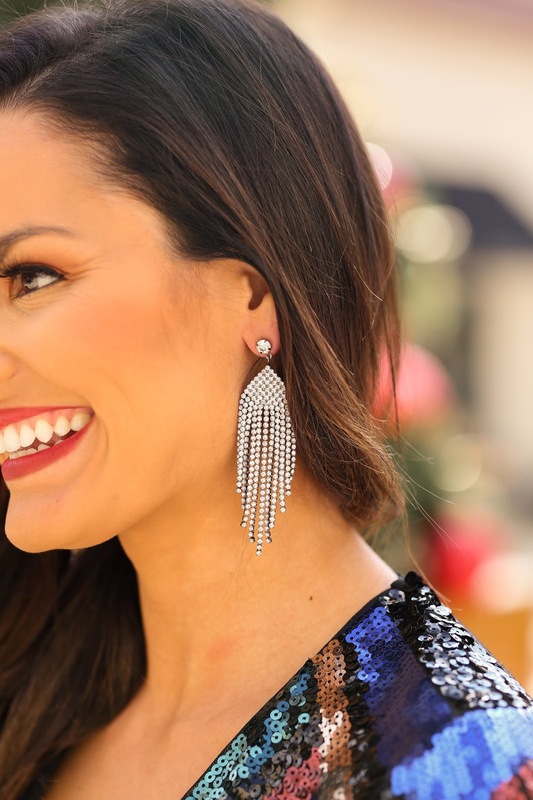 I am so excited to partner with Express to bring you one of my favorite Holiday looks; this gorgeous multicolor sequin dress. To me, the Holidays are all about shining and being happy with all of your friends and family. The Holidays truly are magical and they are such a fun time of celebration. I love wearing sequins during the Holidays because I feel like it embodies this fun time of celebration. Nothing says "let's celebrate" like a good sequin outfit. If you are looking for a good party dress, Express has the BEST selection. They have soooo many sequin dresses and all of them are so cute. I am linking all of my favorite ones above and below for you. All of their dresses and jumpsuits are just perfect to wear to any Christmas party or New Year's Eve celebration. Plus, make sure to check out their Black Friday deals that are going on! A lot of these Holidays look will be on major sale! Express also has the best accessories. My earrings, purse, and shoes are all from there. You can check out the rest of their accessories here. No matter what Holiday look you end up picking out, I know you can find the perfect accessories to go with it at Express. Hope you all have an amazing Thanksgiving! And don't forget to check out Express for the best Black Friday deals! Thank you to Express for sponsoring this post. As always, the thoughts and opinions are all of my own.